A State Government survey of sewage management systems in NSW showed that up to 70% were experiencing some type of failure. In 1998 new legislation (under the Local Government Act, 1993, Section 68) was introduced that made it mandatory for local councils to monitor and approve the operation of all on-site sewage management systems and ensure that those systems complied with environmental and public health performance standards. All Councils that have unsewered suburbs must implement an inspection regime and issue an Approval to Operate certificate for all on-site sewage management systems in their local government areas. In addition to this, councils must develop an on-site management strategy and keep a database of all on-site sewage management systems. This new legislation was introduced as a result of the much publicised Wallis Lake incident, where 400 members of the public became severely ill after consuming shellfish from the region. Faulty on-site septic systems were suspected to be the source of virus which caused the illness. Liverpool City Council estimates there are approximately 3,500 on-site sewage management systems in our local government area. All of these on-site systems are required under legislation to be inspected. An on-site system is a miniature sewage treatment plant, if it is misused, overworked or incorrectly maintained it will fail and potentially be a public and environmental health risk. Anyone thinking of installing an on-site sewage management system. What do the inspections involve? You will be notified by mail when Council's Environmental Health Officers are in your area. 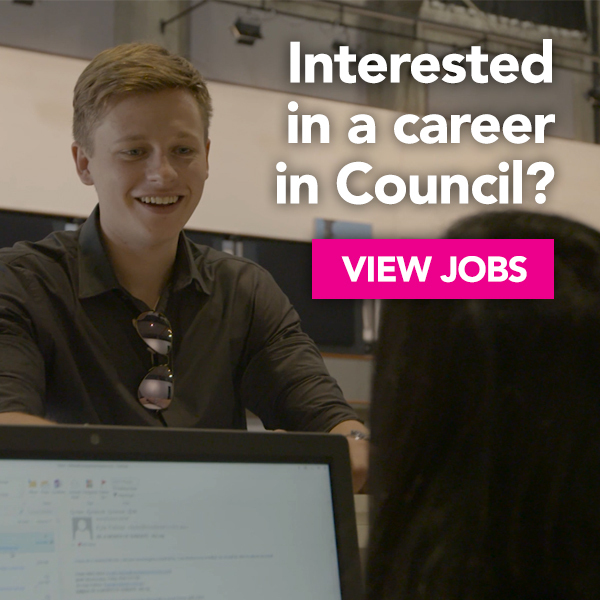 A Council Environmental Health Officer will inspect your system. Your system will receive a rating based on the risk - high, medium or low. If there are no operating problems your system will continue to receive approval to operate. If failing you will be asked to do work to rectify the problem. Your systems inspection frequency will be adjusted depending on your risk category. A working on-site system will have a thriving bacteria culture which, through their metabolic activities, breaks down sewage in the septic tank. Once disposed of through the soil, soil micro-organisms further purify the effluent. Unfortunately, many things can go wrong, particularly the beneficial bacteria being killed and soil absorption/filtration capabilities degrading over time. This, combined with unsafe effluent disposal practices, can result in serious public and environmental health risks. There are a number of laws that govern the approval, operation and regulation of on-site sewage management systems. Fines for a system contributing to serious pollution of the environment range from $4,000 on the spot fine for an individual. Corporations risk on the spot fines of $8,000. Corporations responsible for contributing to serious pollution of the environment face penalties of up to $1,000,000, plus a further $120,000 for each day the offence occurs, while individuals face penalties of up to $250, 000 plus $60,000 for each day the offence occurs. Many residents do not realise that as the septic system owner, they are legally responsible for ensuring the safe and efficient functioning of their system. Failing septic systems can have environmental and public health effects which reach beyond the residential premise. This was demonstrated in the Wallis Lake oyster incident which resulted in members of the public contracting hepatitis. Ensuring effluent disposal areas are protected from damage from vehicles and livestock. Minimise the use of disinfectants and antibacterial products. These products kill micro-organisms that are essential to septic system functioning. Install water efficient appliances where possible. Be careful in your selection of washing powders. Most washing powders are high in Sodium and Phosphorous. These elements eventually build up in the soil were the effluent is discharged resulting in vegetation being killed off. Don't pour excessive amounts of oil and grease down the sink. This will result in an overly large scum layer forming in the septic tank. Don't put hygiene products, tampons, nappies, wet wipes etc. down the toilet. This will clog the pipes and the tanks. Dispose of them in a separate bin instead. Check if your septic system needs a pump out. Over the years, solid sludge will accumulate at the bottom of the tank. This has the potential to block the system. If the sludge level reaches 30 percent of the tank volume, then it is in need of a pump out. As a general rule, most households need a pump out every 3-5 years. A constant unpleasant stench from the septic tank usually means that there is excessive sludge build up. You can engage a wastewater pump-out operators or service contractors or check your system for you and arrange pump out where required. The monthly use of enzymes (i.e. Actizyme) will nourish bacteria and clean the septic tank. If the tank smells, you could also try adding a 2-3 cup of lime and 2-3 bags of wheat germ. Gypsum can also be added to the irrigation area occasionally. Prevent the absorption trench from becoming waterlogged by directing stormwater run-off away from the trench. The majority of on-site systems fail because of excessive use of water overloading the system. Minimise the amount of water used wherever possible. Heavy objects placed on, or vehicle/livestock traffic on sub-surface irrigation areas. This can damage the irrigation lines and cause water to pool in a single location rather than be evenly spread across the irrigation area. A consistent sewage smell which typically indicated that the system is in need of a pump-out, it has not been recently serviced / mechanical parts have failed or antibacterial chemicals such as bleach or other disinfectants have killed the good bacteria in the system. Cracked lids and open inspection holes. This encourages shelter for the breeding of vermin and pests. Effluent application areas not being regularly mowed which promotes the pooling of effluent and reduces nutrient uptake. Some owners of AWTS units are under the impression that the liquid product generated is of drinking quality. This is NOT the case and contact with effluent should be avoided. Owners of AWTS with spray irrigation using high powered sprays or misting sprays which causes effluent to become airborne. Spray irrigation coming into contact edible plants / fruit trees etc. Lack of servicing of system. AWTS’s are required to be serviced every 3 months as they have many moving parts that require maintenance and also rely on consumables such as chlorine tablets. Failure of the mechanical parts or depletion of consumables leads to inadequately treated effluent. Extremely strong chlorine smell coming from AWTS. This indicates a very high free chlorine reading which can kill important microorganisms in the soil. Some residents not realising that there property is un-sewered. This is mostly a problem with rented properties. Grass or other vegetation ingrown into the tank. Decorative objects such as ponds placed on top of on-site systems to disguise them. This obstructs maintenance and inspection. Absence of Reclaimed Effluent Warning Signs, as shown below, in AWTS disposal areas. 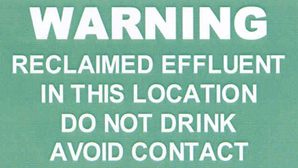 Warning Sign that must be displayed in all irrigation areas for Aerated Wastewater Treatment Systems (AWTS). Should you require any further information on On-site Sewage Management Systems, Contact Council's Customer Service Centre on 1300 36 2170 and ask to speak to an Environmental Health Officer.